Dwarf hamsters are one of the smallest pet rodent breeds, measuring 2 inches at full adult size. Prolific breeders, female dwarfs can have as many as 10 to 12 litters a year, with an average litter size containing eight to 12 babies. Because of the animal’s small stature, some pet owners don’t even know their hamsters are pregnant until litters arrive. Dwarf hamsters usually give birth at night. The birthing process can take several hours, depending on the size of the litter. If the father is in the same cage as the mother at the time of birth, he may assist in the process, helping the mother clean away umbilical materials as she delivers each baby. If your hamster shows signs of troubled labor, such as a baby that appears stuck or not moving through the birth canal, contact a vet for guidance. The birthing process takes a physical toll on the dwarf hamster mother. She will be exhausted after the process, but she will be protective of her offspring as well. Don't try to touch the mother or her nest, as she may become agitated and attack you in defense of her young. Make sure she has easy access to her water bottle, as she will be thirsty and in need of hydration. The mother dwarf hamster will keep her young tucked under her body in a form of nest as she nurses them. Babies will nurse exclusively for approximately two to three weeks, at which point you can wean them onto a commercial hamster food diet. Avoid touching the babies for the first week, as you'll alarm the mother. Provide your hamster a regular supply of fresh water and food throughout her pregnancy and while she is nursing. Provide her ample protein-rich foods like leafy greens and sunflower seeds. Young hamsters reach sexual maturity at 3 weeks of age and should be separated into gender groups at that time. 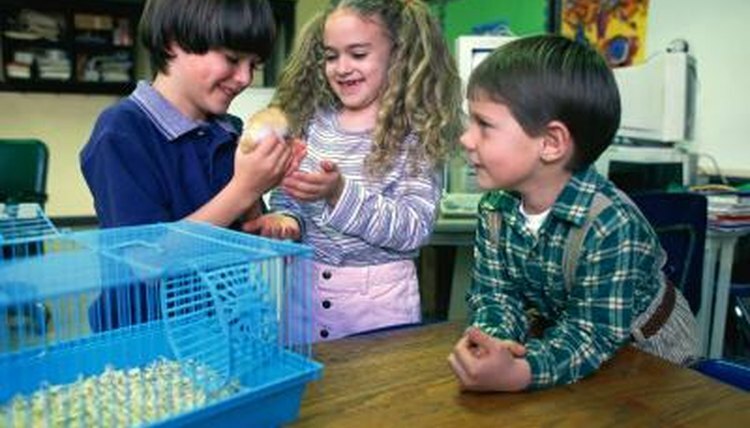 It can be difficult to tell then genders of dwarf hamsters; professional sexing is the best way to ensure you have the young separated into appropriate groups. Parent and sibling dwarf hamsters will rapidly mate with one another, so take every precaution against producing unwanted litters. While the dwarf father is willing to help the mother through the birth process, he has an ulterior motive. The dwarf mother is immediately fertile again after giving birth, and if the father is not removed from the cage, mating will occur. If a mother dwarf becomes overstressed in trying to care for two back-to-back litters, she may kill her young. Additionally, if the father sees the young as a threat to his mating, he may kill them as well. What to Do After Guinea Pig Delivery?